Kim, thanks so much for featuring my favorite room on your beautiful blog. It's an honor to be here and I don't want to disappoint your readers. While it was hard to choose a favorite room, I finally decided upon the kitchen. I love to cook and consider myself to be a bit of a foodie. I try to use local, organic foods as much as possible ... and I prefer meals made from scratch. Of course, cooking from scratch takes longer to prepare than pre-packaged foods, which means more time spent in the kitchen. So good thing I like my kitchen, right? My house was built circa 1875 so my kitchen is definitely farmhouse style. I love the old built-in cupboard on the left. It holds a lot of stuff, which is good because we have no upper cabinets in the kitchen. This free standing cupboard is from IKEA and fits perfectly under the open shelving. We have plans to add more shelving on other walls in the kitchen. I hope to complete that project soon! The big white mugs were a Christmas gift from my daughter and yes, they're perfect for a big cup o' Joe! On to the other side of the kitchen ... the working side where the kitchen island provides more counter space. As you can see, a trio of windows prevents us from having upper cabinets over here. But I love the windows! The back door leads to our fenced in backyard. I love to keep this door open in the summer so the breezes can blow in through the screen. We added the bead board on the kitchen walls a few years after moving in. They're painted with high gloss kitchen cabinet paint so they're super easy to clean even though it's white. The kitchen cabinets are painted Tortilla by Martha Stewart. The little cabinet on the floor used to hang on the wall. But it's location was a head bumper so we pulled it off and set it on the floor instead. It's quite an old cabinet but I don't know if it's original to the house. Back over to our little dining nook where you can see the Mexican tiled floor. A couple of mirrors on the walls helps to bounce the light around. The small table has a leaf and can seat up to 6 people. For bigger groups, we eat in the dining room. Would you like to join me for a little vino and some appetizers? Now that the kitchen is clean I can mess it up while making French macarons. I do love my kitchen despite all its quirkiness. 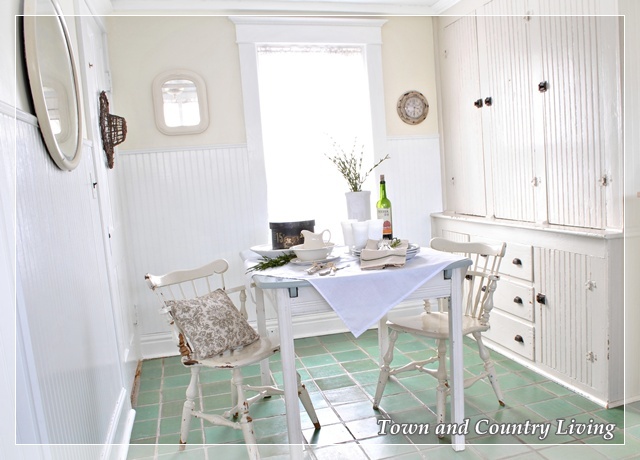 To see more of my house I hope you'll come visit me at my blog, Town and Country Living. 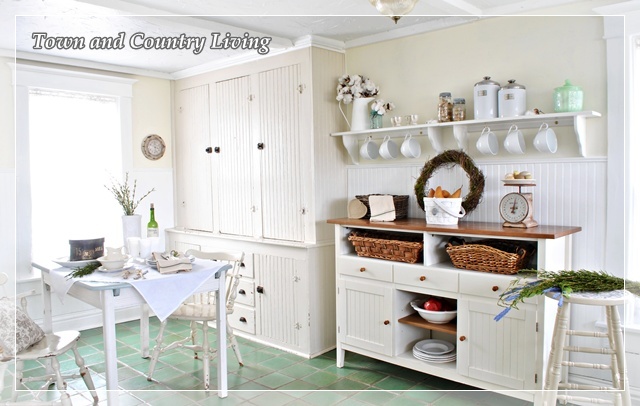 Thank you, Jennifer for sharing your charming farm house kitchen. If y'all haven't visited Town and Country Living please get comfy and go look around at the rest of her lovely home. If you have missed any of the past guest posts you can find them here or just click on the tab at the top of the page that says guest series. Thank you for sharing Jennifer's cottage kitchen! I love a white kitchen!! I'm so happy to see Jennifer's kitchen featured! Her kitchen is one of my favorite white kichens. So beautiful! A dream kitchen for sure. Thanks Kim for sharing Jennifer's kitchen. I love her kitchen so pretty. I love how the light comes in that room. 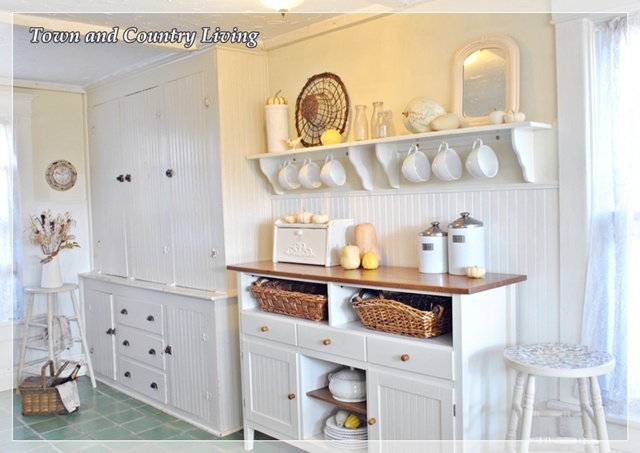 Jennifer's true farmhouse kitchen is so beautiful...The addition of the Ikea cabinet goes so perfectly!...Just love her style and "styling"...How great it must be to live in a beautiful farmhouse that is almost 150 year old...Kim, thanks for presenting Jennifer's favorite room...and Jennifer, I can see why this is your favorite room...just wonderful!!! 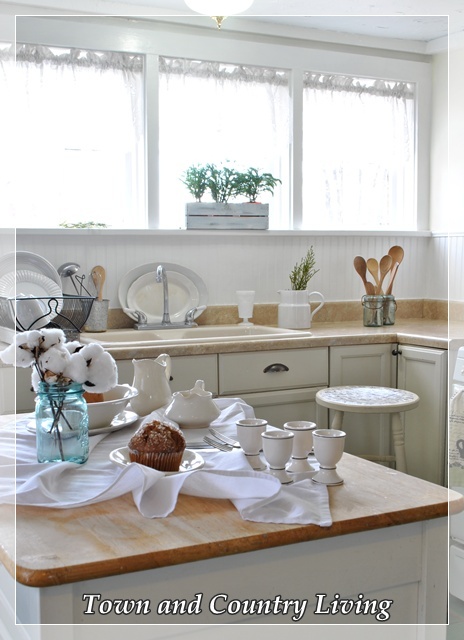 I absolutely adore Jennifer's kitchen..in fact her entire home is fab! Great feature Kim. Great kitchen, Jennifer, I love it! Love the cottage feel. You've got some great natural light in here. I miss that most of all living in a condo now. 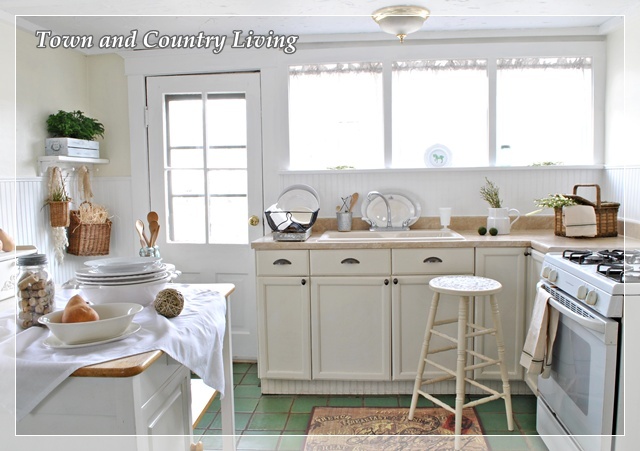 Beautiful kitchen Jennifer, I love the farmhouse style it has!! Love all the pretty accessories too! Cute, cute, cute! Love Jennifer's kitchen. Beautiful kitchen, sure wish I had that much storage!!! What a fun kitchen!! 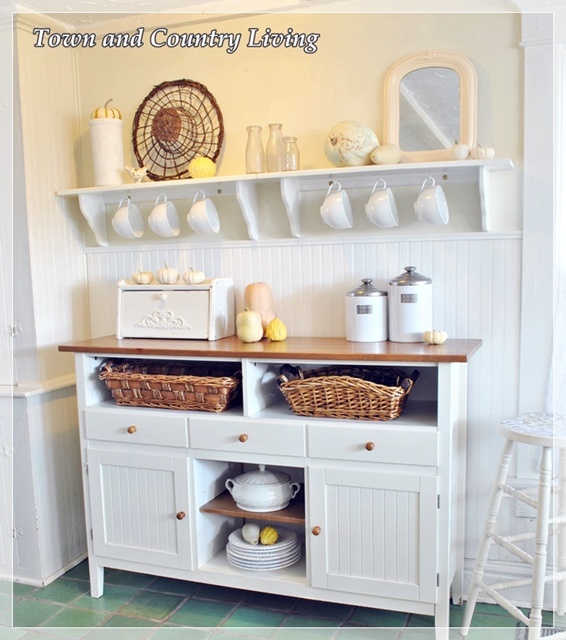 I love the quaint cabinet, and the fact that the kitchen has been kept close to its roots! Kudos. What a beautiful, light white kitchen. So charming. Love it. Great kitchen! I'm sure that there must be drawbacks, but I'd love to live in a really old home, such as this. If the walls could talk! Such a beautiful kitchen. 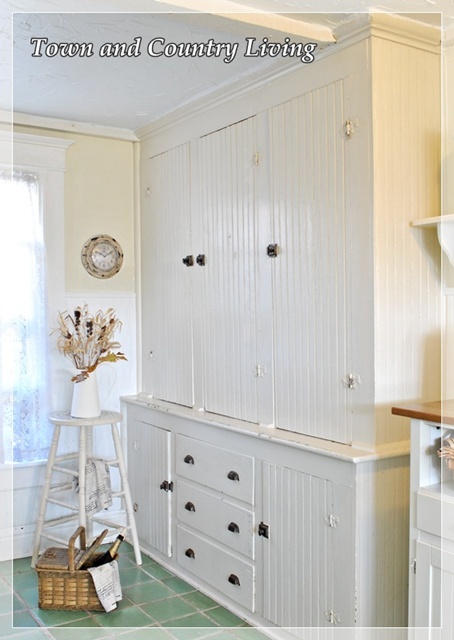 I can never get enough beadboard! 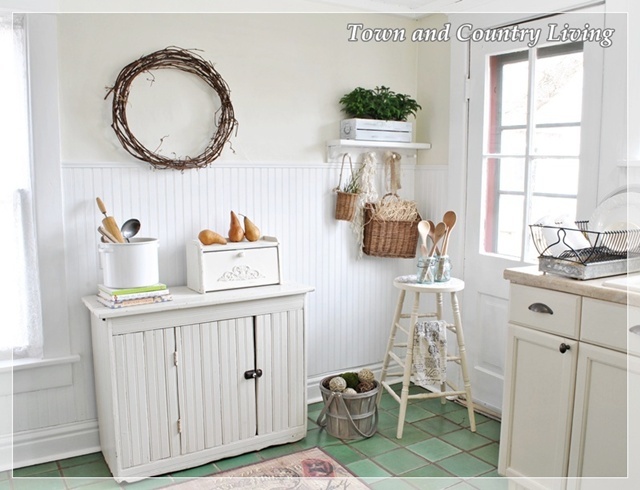 Cute farmhouse kitchen. Luving all the light. Great kitchen Jennifer. Luv all the built in cupboards. I love the kitchen!! It's so bright, and pretty. I love the beadboard too. Thank you for sharing...what a gorgeous kitchen. 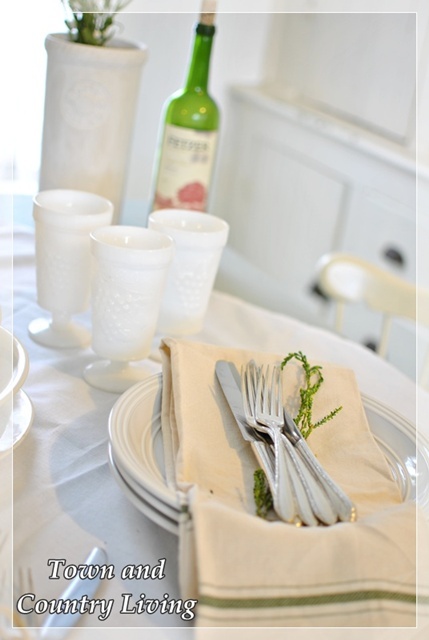 I love the bright, white feel...clean, crisp, yet homey! Great feature!! I LOVE Jennifer's kitchen with all it's farmhouse style. I adore her kitchen! It is so charming and I'm also loving how the light bounces around the room off all that white. Jennifer's kitchen is so lovely and bright! Love the farmhouse style. I just love Jennifer's kitchen! She has added so many wonderful touches. Jennifer, you kitchen is just my style. It is so unique and inviting and full of great pieces... and it's white, my favorite! Our first home was 120 years old and had great cabinets, very much like yours. There is a whole lot of space to put things!Painting your bottom cupboards tortilla gave the whole area depth and warmth. What a great choice. And your windows... Oh, I bet your kitchen stays nice and bright!!!! I would trade cabinet space for bigger windows! I bet your friends love to come through your back door! Kim, thanks for hosting this wonderful series... and picking Jennifer. She has such a darling kitchen!!! I can't wait to get to my computer on fridays to see what favorite room you will feature next. Very bright and cheerful. Very well decorated. What a treat! Jennifer's kitchen is beautiful! Jennifer already knows that I love her kitchen. Well...I love all her home. Kim, you always choose fantastic options in this guest posts, thank you. Besos and congratulations to you two!! I adore Jennifer's kitchen! 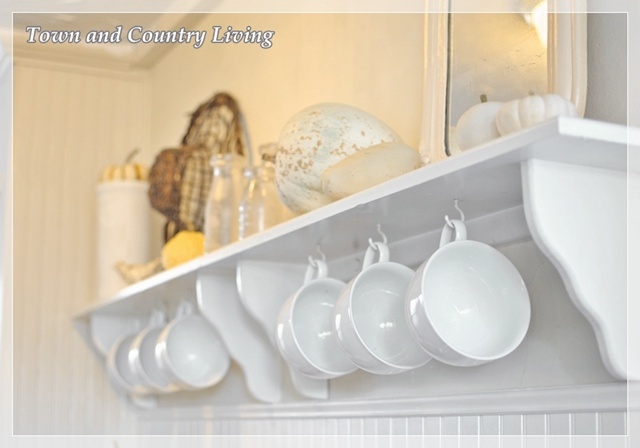 She is a master at combining old and new and making it all fit in her farmhouse with style! I love how light-filled it is! What Jennifer calls quirks I call originality, personality, and character! They don't make 'em like that anymore and people pay a lot of money to recreate what she has. I can see why she loves it. I don't see quirky, I see charming. It's unique and it's not a cookie cutter kitchen. It certainly has a lot of character. I'd take it any day over a big box store kitchen!! Your kitchen is so beautiful and bright!! Even on a grey day, your kitchen would bright.